"3M Fluorinert is the best liquid to realize the tremendous advantages of liquid immersion cooling. I have confidence in its advantages, including high dielectric strength, low evaporation loss with a high boiling point, and high cooling performance that allows for high density in volume designs"
ST. PAUL, Minn.--(BUSINESS WIRE)--PEZY Computing, a Japan-based, microprocessor company, earned the top three rankings on the Green500 list, using a 3M™ Fluorinert™ Electronic Liquid in ExaScaler Inc.’s immersion cooling process. The Green500 is a biannual ranking of the most energy-efficient supercomputers in the world. The triple win indicates growing progress and adoption in the field of immersion cooling with engineered dielectric fluids and its potential to transform the high performance computing (HPC) industry with step-change improvements in energy efficiency and compute performance. Critical to an HPC’s Green500 ranking is its cooling system because managing the massive amount of heat generated by supercomputers requires a lot of energy. It’s a problem that’s followed HPC since its origins, and over the years, several methods – utilizing air, water, mineral oil and dielectric fluids – have been introduced and reimagined several times over. 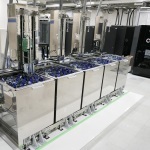 Immersion cooling in engineered dielectric fluids is proving beneficial with its cooling capacity and corresponding energy savings; it also creates a reduction in physical space and mechanical infrastructure – liberating companies from large server rooms and expensive cooling hardware. “Existing cooling technologies have significant limitations for HPC. Air cooling is constrained by cooling efficiency and energy consumption. Oil cooling, although energy efficient, raises concerns with handling and maintenance. In contrast, this immersion cooling system has advantages with both serviceability and cooling efficiency. 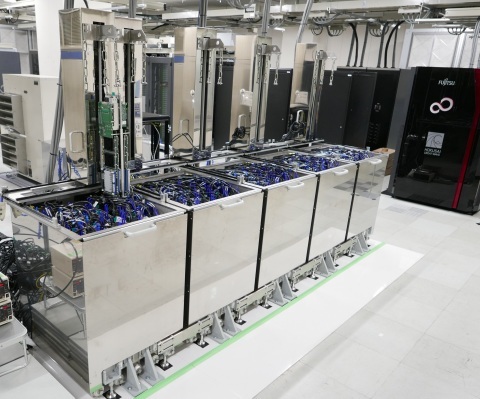 I expect that immersion cooling technology has high capability to lead and develop next generation HPC,” said Motoaki Saito, CEO at PEZY Computing as well as Co-CEO at ExaScaler. “3M Fluorinert is the best liquid to realize the tremendous advantages of liquid immersion cooling. I have confidence in its advantages, including high dielectric strength, low evaporation loss with a high boiling point, and high cooling performance that allows for high density in volume designs,” Saito continued. To make the top rankings on Green500, HPC systems must also deliver compute performance. All three of PEZY’s systems broke the previous 6 gigaflops-per-watt (GFLOPS/W) threshold, with the top-ranking “Shoubu” from RIKEN coming in at an impressive 7.03 GFLOPS. Immersion cooling helped them surpass previous benchmarks in processing speed and power without thermal issues limiting performance. A 3M Fluorinert electronic liquid, a dielectric heat transfer fluid, was used in all three of the winning systems’ cooling processes. The fluid is part of a family of fully-fluorinated compounds known as perfluorocarbons that have been in use for over 50 years in demanding military and aerospace applications. They offer a wide range of boiling points, low toxicity, non-flammability and Zero Ozone Depletion Potential (ODP). 3M Fluorinert does have a long atmospheric lifetime and a high global warming potential (GWP). However, when it’s used in closed systems – such as PEZY/ExaScaler’s – emissions can be managed and controlled. The age of the energy efficient HPC has arrived and PEZY/ExaScaler has recognized that immersion cooling will clearly lead the way. As organizations in and outside of the HPC industry consider their growing need to aggregate computational capacity, energy efficiency becomes a huge factor in improving performance and reducing environmental impact and operational costs. 3M produces a whole family of dielectric heat transfer fluids for this application, including the environmentally sustainable 3M™ Novec™ fluids. These breakthrough dielectric fluids are non-ozone depleting, have low GWPs, and are low in toxicity. Many of the leaders in the HPC industry are using Novec fluids to solve their thermal management issues in a variety of ways, including full immersion with single-phase heat transfer and two-phase immersion cooling. With the ability to significantly reduce energy consumption compared to traditional air cooling, 3M dielectric heat transfer fluids can help PEZY/ExaScaler and other leaders in the HPC industry achieve even bigger breakthroughs in the near future. More at www.mmm.com/datacenter. 3M, Fluorinert and Novec are trademarks of 3M Company.